Jobs for qualified bakers are as varied as the products they make. From birthday treats to wedding cakes and everything in between, bakers and their creations mark life’s events, and add up to a $5 billion industry in Canada, with plenty of opportunities for new entrants in the trade. Skilled bakers can create artistic confections in restaurant and hotel kitchens, or specialize in bread production at a large commercial bakery. Increasingly, bakers are going into business for themselves, opening shops or catering operations focusing on cookies, cupcakes or artisanal breads. Large companies offer management opportunities and, for anyone with a taste for adventure, resorts, ski lodges, cruise ships, and wilderness camps need bakers too. That demand is driven by a pattern seen throughout the food industry: just as consumers are becoming more interested in higher quality, made-from-scratch products, a generation of journeyperson bakers is retiring. That specialization has boosted demand for bakers but has made the training process more challenging. Bakery owners might want to take on an apprentice but not have a Red Seal baker on staff, or they may not produce the range of products needed to complete an apprentice’s training. BAC’s BC chapter hopes to address these challenges with its new pilot, the Junior Affiliate Program. 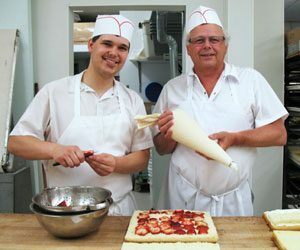 Students and apprentices will be connected with mentors — Red Seal bakers who can, if necessary, sign off on work-based training hours and also provide coaching, mentoring, networking opportunities, and job placement assistance. A key part of the mentorship program will be an opportunity for mentee apprentice bakers to cross-train – to learn skills not offered in their current job. If successful, this will be rolled out nationwide. Andrew Gunn, an Area Manager and Product Development Manager at COBS Bread, makers of handcrafted bread at over 70 locations across Canada, welcomes the initiative. “Since COBS specializes in bread our challenge is being able to sign apprentices off on all of their Red Seal requirements. There’s a whole range of things, such as cakes and pastries, which we can’t cover because we don’t do them. With the Junior Affiliate Program we would, for example, be able to partner with hotels or other specialized bakeries, which typically don’t make bread, but do make cakes and pastry, so we’d have the best of both worlds,” he says. Helping new bakers complete their training is a key part of the program, but mentors will also provide general guidance, adds Barnett.